When I was probably eight years old, my friend Amber had chickens. Growing up we had lots of garden space and goats as well, but never chickens. This seemed odd to eight year old me. Why not have free eggs and cute baby chicks running around? I had long given up on my campaign for a horse, but chickens – that seemed reasonable. So I approached my parents with my plans to forego the lemonade stand and instead to raise chickens and sell the eggs. They shot down my dreams so fast. Later, I tried to pull off the “It’ll be a 4-H project” thing. That didn’t work either. So I tucked my dream away and told myself that when I was a grown up – my chicken dreams would come true. Fast forward to marriage. I just assumed that Josh would be up for chickens. He’s up for anything. We moved into our current house and I was ready! Guess what? Josh shot my dreams down too. It was looking like chickens were a long lost dream. I started petitioning our fantastic neighbors, Klint and Kyle. I mean, they play country music. 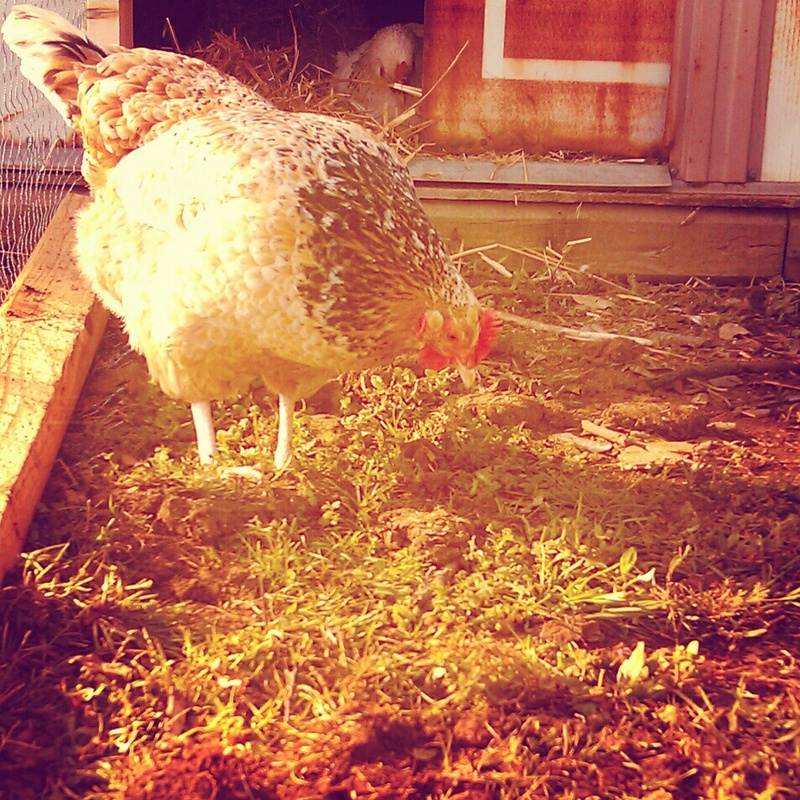 Chickens in your yard can ONLY add to your country cred, right? 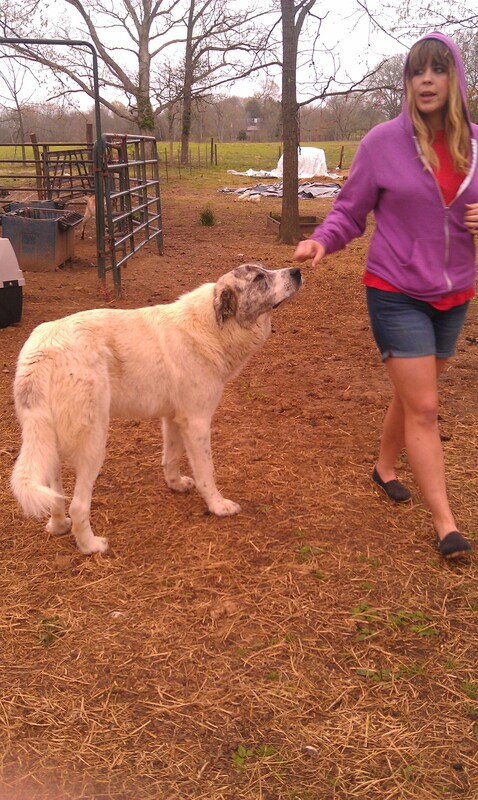 I thought that THEY could get the chickens and I could help out. They wouldn’t be in my yard, but they’d be my chickens, you know? But it’s hard when you’re the only one breathing life into a dying dream. The only part of the dream that wasn’t great was having to ride next to a dog crate full of chickens and their excrement. 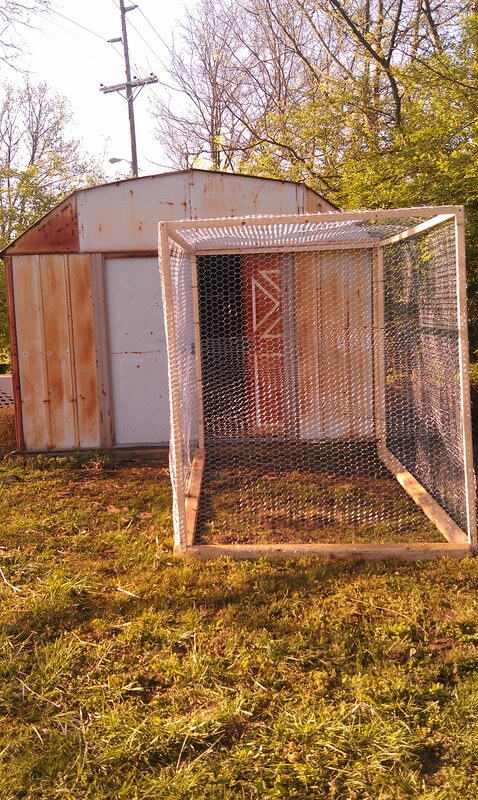 We even built them this adorable chicken coop out of an old shed. Yeah, I know I’m leaving Nashville in a few weeks. 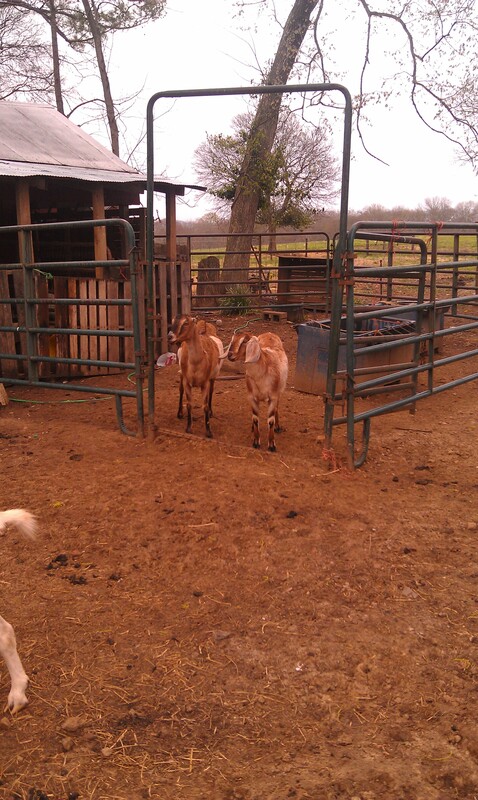 But, the chickens will hopefully be kicking it when I return. Plus I think I’ll have access to chickens in Haiti too, so I’ll live. Thanks to Klint and Kyle for providing the yard and muscle. And Casey and Savannah for getting this up and going. 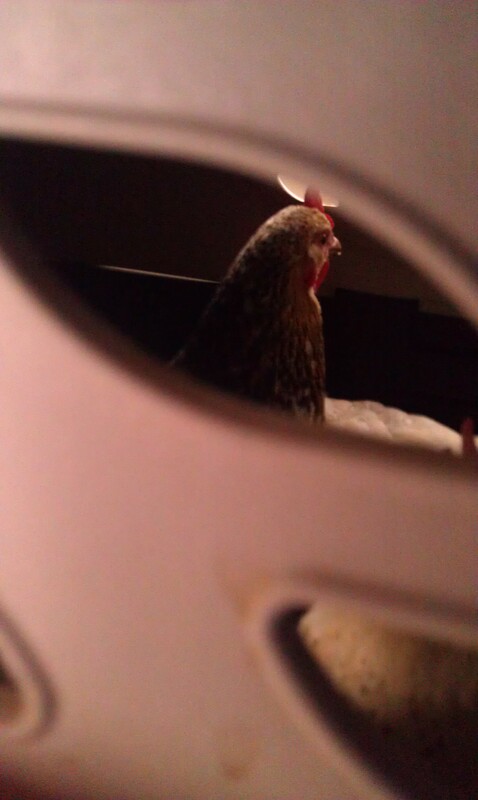 And Grace (their new third roomie) for also promising to care for the Joyce Lane Hens. So here’s my word of advice. When you have a dying dream, surround yourselves with people who will fight for it. No matter how silly it may seem. 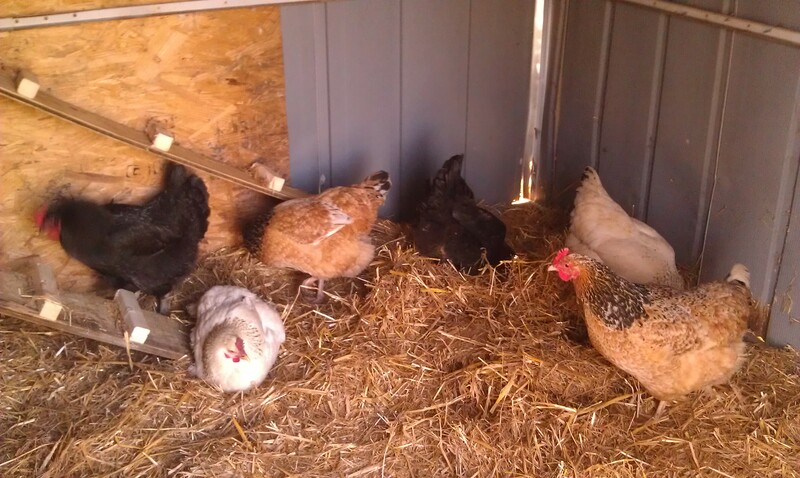 Categories: About Us, Life | Tags: backyard chickens, chickens, farms, homesteading, life, Marriage | Permalink. 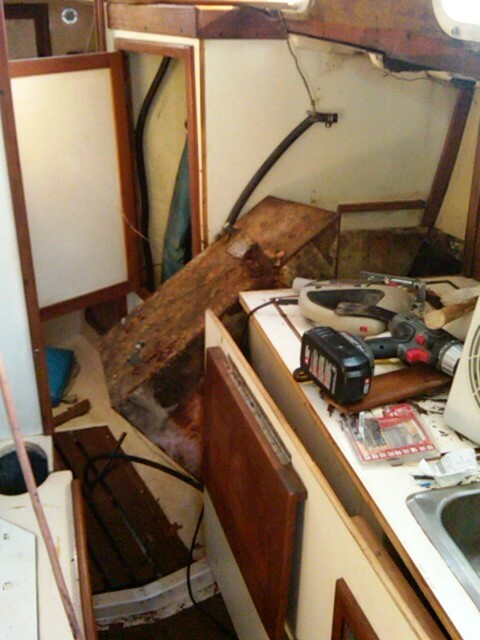 When we got Romany it was a wreck. 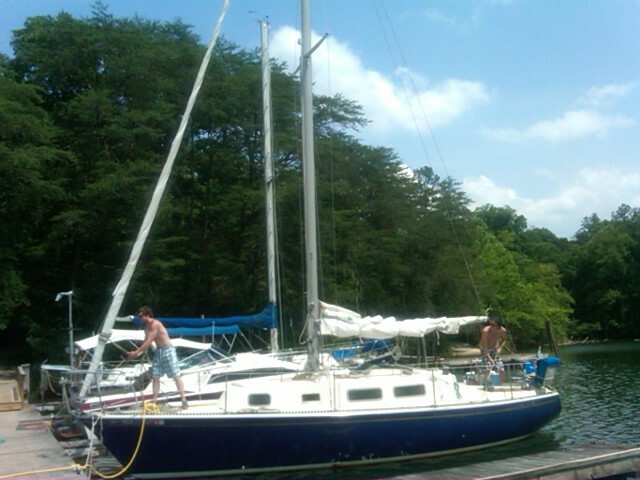 Josh bought it, had it shipped, and docked in Chattanooga before I ever saw it. If I had seen it before we would have never owned it. 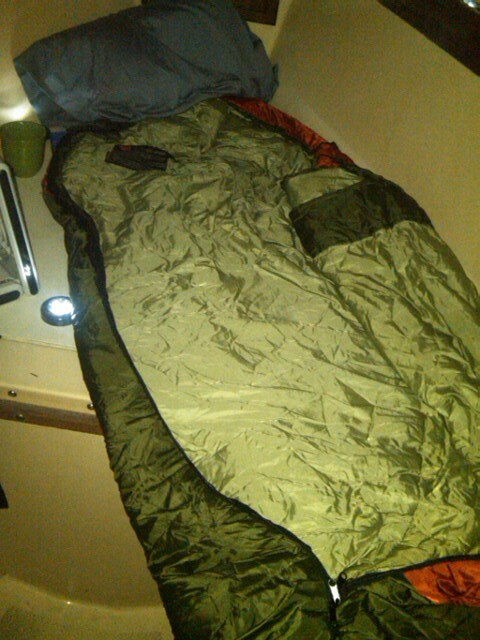 The first night on the boat I cried. I also thought it was going to sink or explode at any moment. This is what I walked into that first night. There were leaks everywhere and it was raining. There were no cushions to sleep on, no working plumbing, and barely functioning electricity. 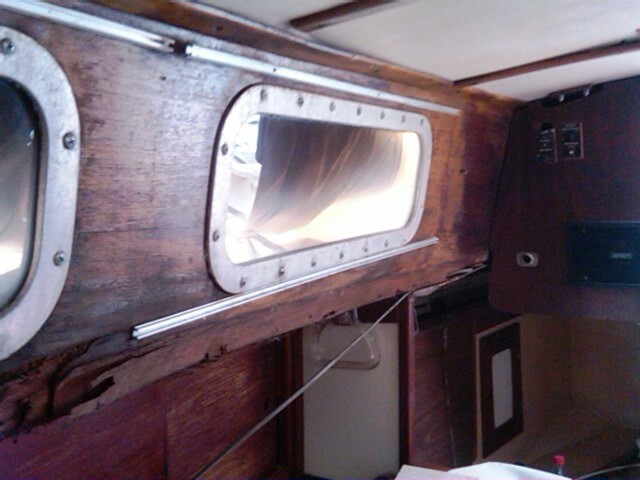 Bit by bit, though, we sanded and cleaned, sewed and ripped out. I even fiberglassed. There were more tears along the way. We painstakingly repaired everything. I still don’t feel like it’s worthy of being called a yacht though. Romany and I have a love hate relationship. Some days I sort of like it’s old weathered personality. Others, however, I want to rip out that old Atomic 4 engine and sink it to the bottom of the lake. We keep going back and forth on the name. We want to change it to Willy – like One Eyed Willy from The Goonies. Changing the name requires work though. We’d have to get the old letters off, repaint, and put new ones on. So, we might be sticking with Romany. I’m fine with it. I feel a little inspired by the Romany name. It all started with Pinterest (dangerous words, folks). I found an image of a “Gypsy Caravan.” This led to a massive pinning session of all things gypsy, boho, and pirate. I have decided that the official style of our boat is “Gypsy Pirate.” Basically all this means is that I have given up on having a cohesive style and have resorted to throwing in anything and everything that I like. Just so you know it’s not too crappy anymore, here’s an updated picture. Know what I like this second? Sugar skulls. That feels gypsy pirate, right? It’s a skull with flowers! So ladies and gents, this leads me to my very first DIY. Taken with pictures from my crap-tastic $20 smart phone. Bear with me. I’ll get better at this I promise. 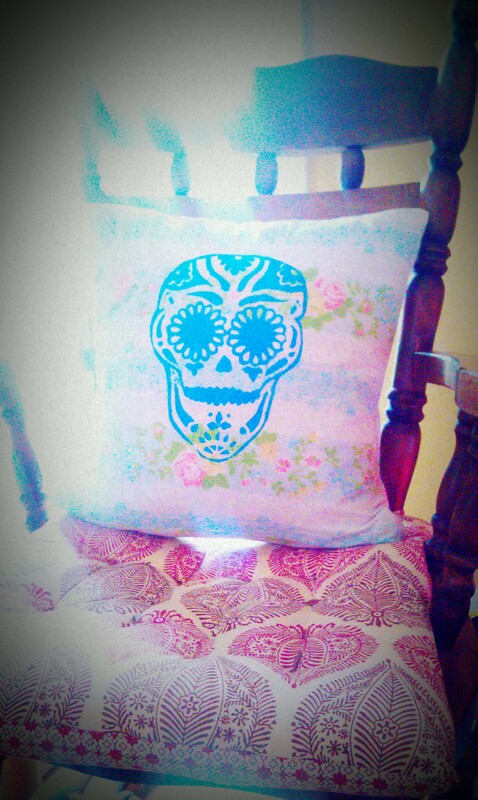 I wanted a sugar skull pillow, but I didn’t want to pay for one (story of my life). 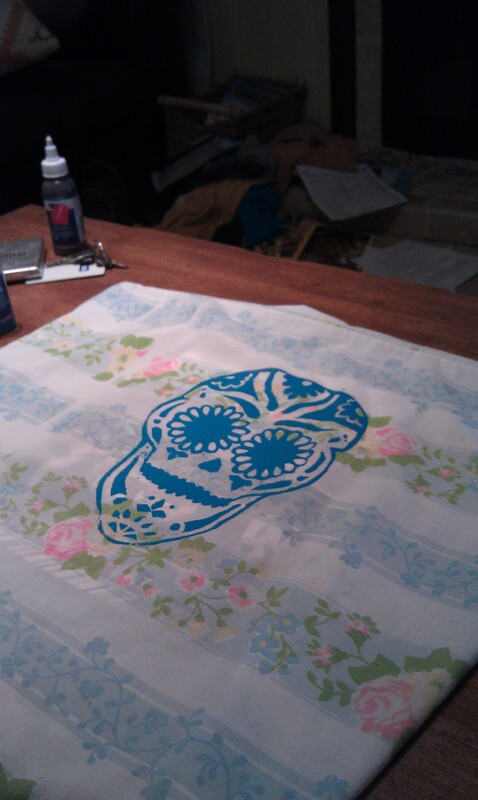 I had an old pillow case from Goodwill that I really liked, so I thought I’d try my hand at screen printing. First, find an image you like or draw one. 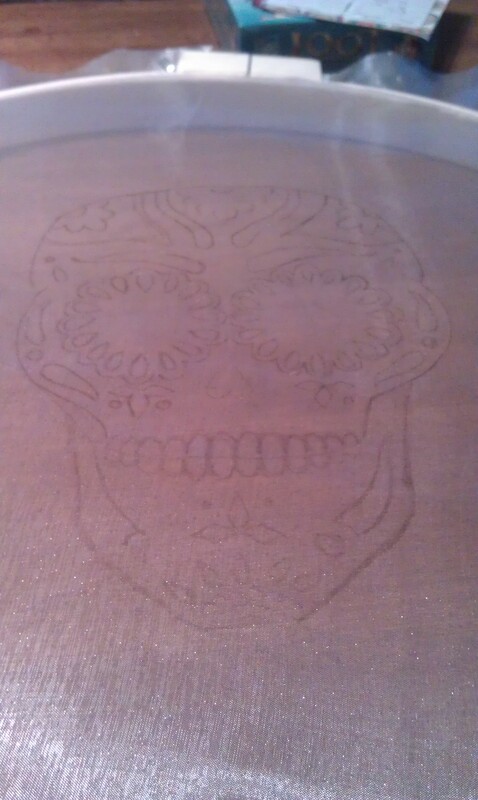 I drew this sugar skull. If your image is detailed like mine was, it’s going to be hard to figure out where the ink needs to go later. So, I took a sharpie and started drawing over my lines. I knew the lines needed to be thick so I clearly knew what needed to be inked and what didn’t. Start with a simple image if this feels confusing. Put your mesh into the hoop and PULL IT TIGHT. 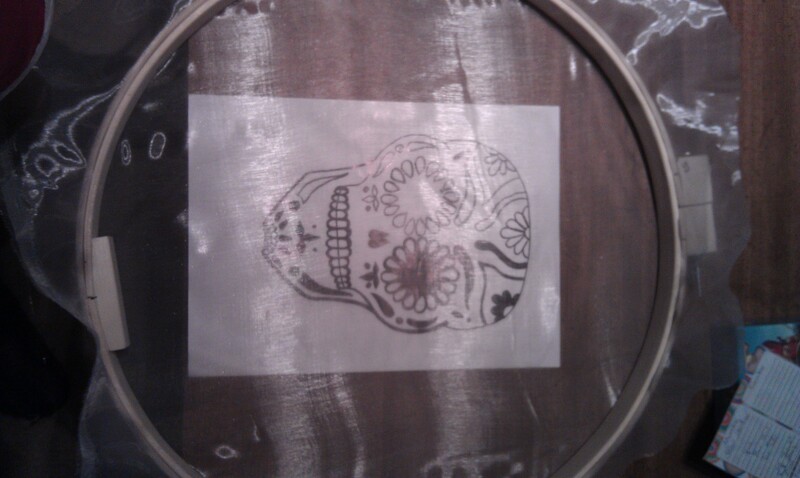 Lay your image or sketch on a flat surface and lay your hoop with the fabric in it on top. 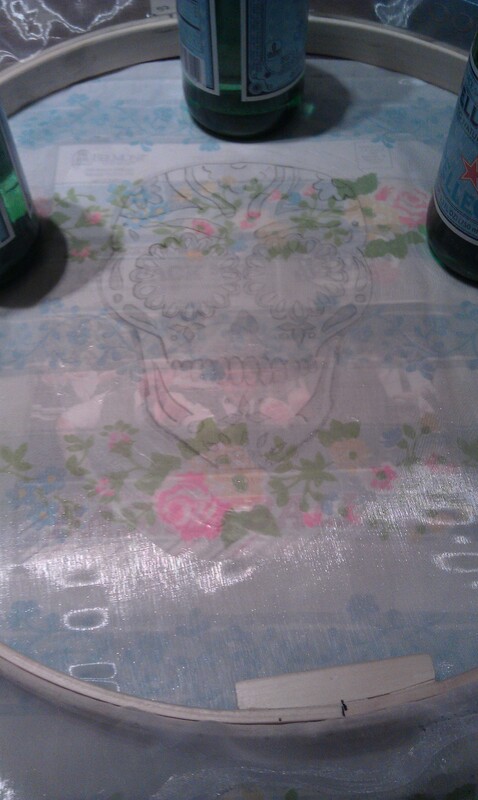 Now trace the image onto the fabric with your pencil. 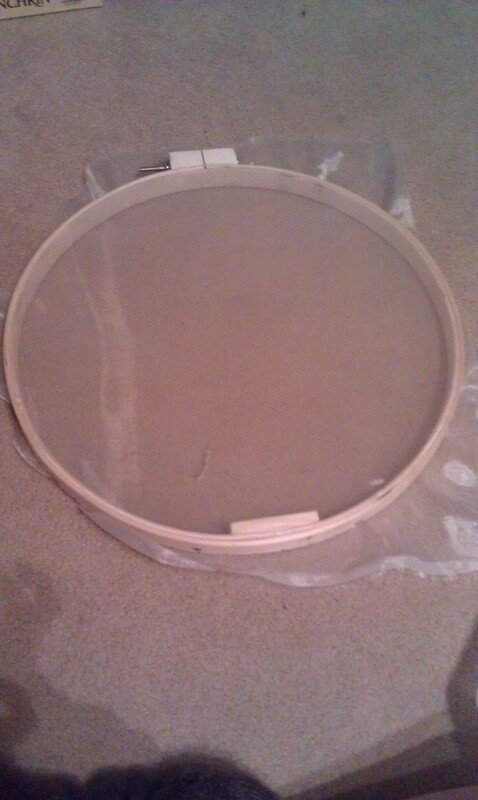 Once that’s done flip the hoop over so that the fabric isn’t touching anything. You’ll probably want to put something underneath because things are about to get messy. 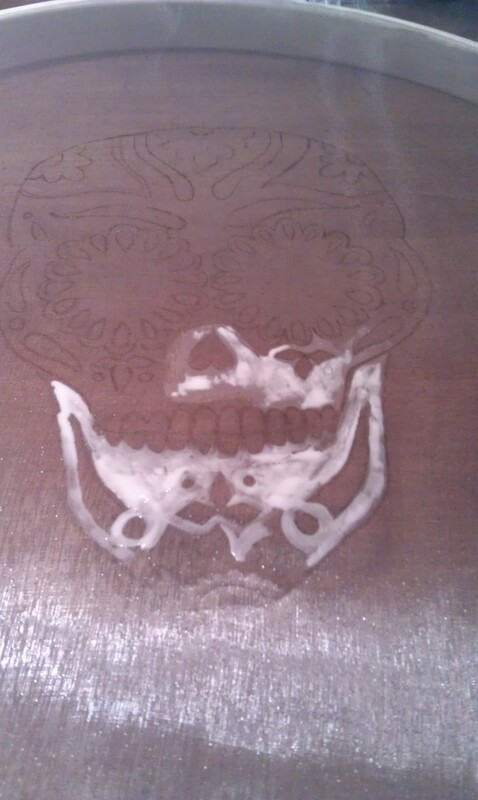 So, now you’ll want to get our your mod podge and fill in all the areas that you do not want inked. Because my image was detailed this took some figuring out. This is where the sharpie comes in handy. Having thicker lines makes this step easier. Once it’s all dry get out your ink and something like an old gift card. 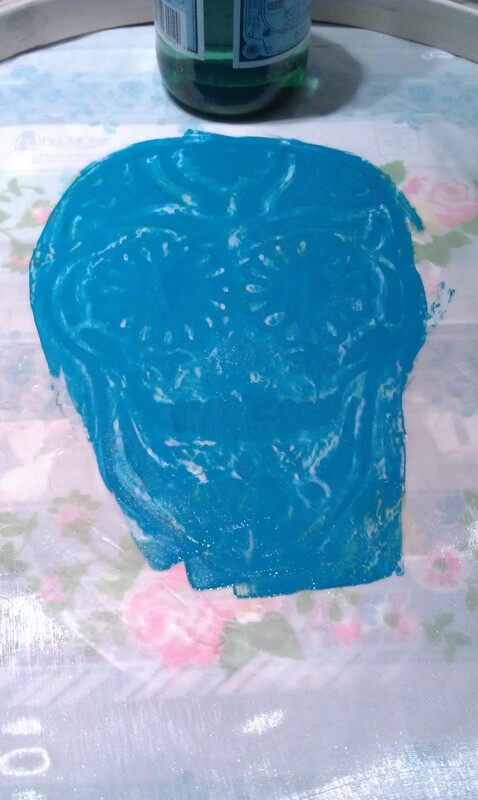 Put down the fabric you want to print on and put something behind it so the ink won’t bleed through (I used wax paper). Place your screen, still in the hoop, flat against your fabric to be printed. I weighted mine down with bottles of water to keep it still. Squeeze on some ink and using the card, squeegee it all over the image making sure to work it down into the mesh and onto the fabric. Lift up your hoop very carefully and voila! Let it all dry and follow the instructions on your ink for setting it. Mine required ironing. Isn’t that the most perfect boho, gypsy, pirate pillow you’ve ever seen? 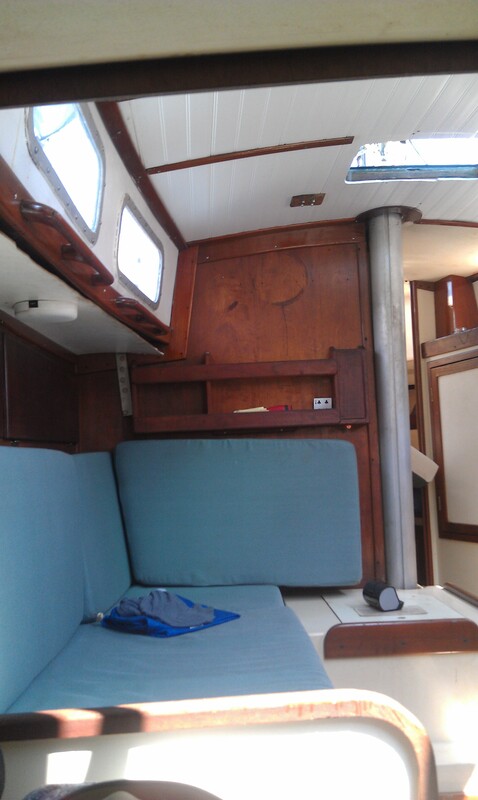 I’m slowly piecing together fun & practical items for the boat. It’s hard because the space is so small, but it’s also a blessing. It’ll be a fun challenge to live simply and feel at home in the space! I’ll keep you updated on how it’s going. 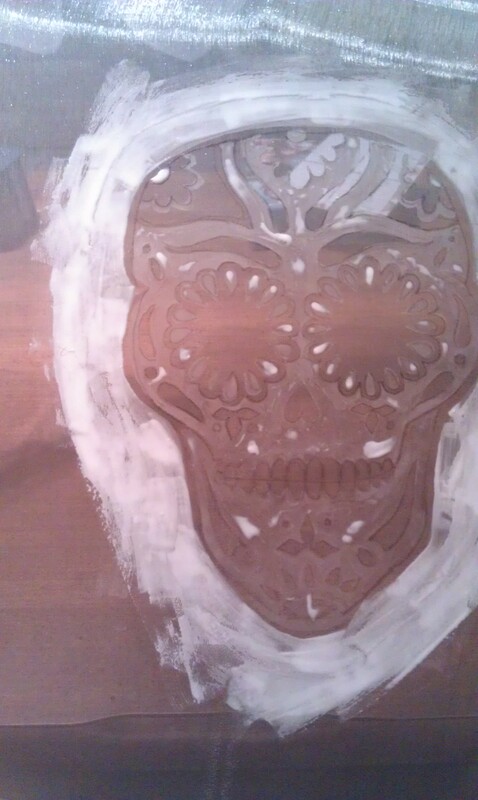 Categories: Boat Stuff, Decorating, DIY, Life, Uncategorized | Tags: day of the dead, diy screen print, goodwill ideas, gypsy pirate, how to screen print, screen print, sugar skulls | Permalink. For Easter, Josh and I spent some time in Alabama since Catholic Charities gives us a lot of time off during that week. I can’t say enough good things about where I grew up. It’s heaven. There’s acres and acres of woods, creeks, and ponds. Our friend, Klint, came down as well and on Saturday we honestly spent the entire day outdoors except for lunch. 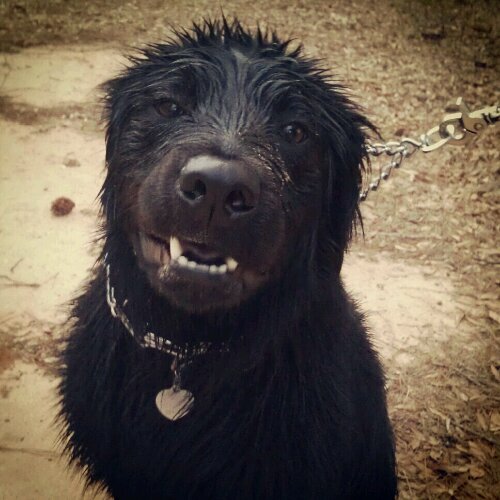 my puppy-niece and she’s stinking cute. Saturday, we woke up ate breakfast and immediately went fishing. Of course, I was the only one who caught nothing. I could literally see the fish giving my bait the middle finger while practically jumping into everyone else’s arms. I switched to a jelly worm and finally got a bite only to lose the fish. I gave up. I basically opted to run errands for everyone and drive the mule around while also playing with Scout. It was a little upsetting, but I recovered. 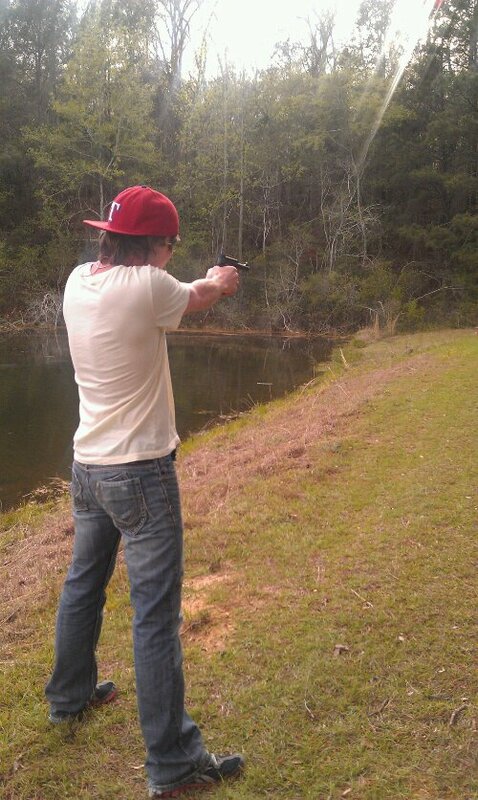 Next, in true Alabama fashion we had to blow something up. We had some tannerite to shoot, so we (being the boys) made up this contraption. It. Took. Forever. They planned and schemed how to get the ultimate show. 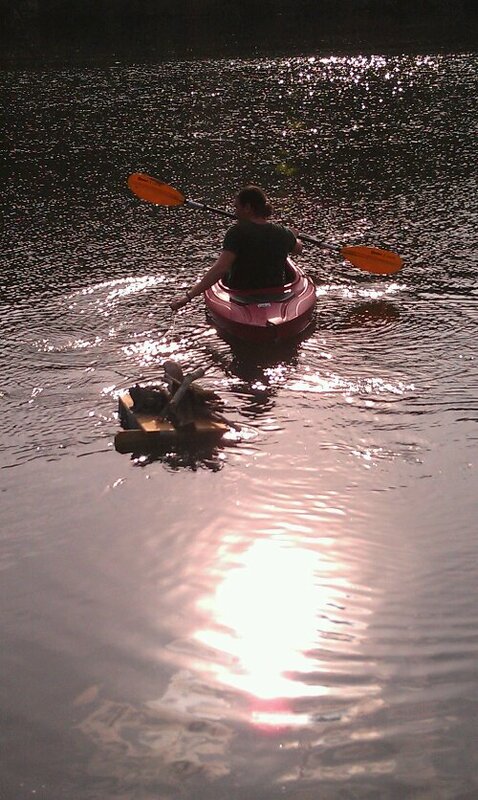 Basically they wanted something to float out in the pond. This required finding flotation devices, then finding something to make a platform out of that wouldn’t sink said flotation devices, then finding that last little touch of something to make it more fun. In this case, the last little something was yard art in the form of a frog. The explosion was fun and all, but I think the time put into creating it was more fun in the end. Taking the contraption out to meet its doom. So the day and really the entire weekend involved a lot of cute dogs, shooting guns, fishing, frying up those fish, and hanging out with family. That is pretty much my idea of perfection!